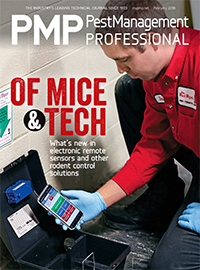 Last February, our cover story dove deeply into comprehensive coverage on remote monitoring systems for rodent control. While devices that are either on or coming soon to the market vary somewhat in their features and processes, generally speaking, remote monitors are designed to alert a pest management professional (PMP) via text or email immediately after a sensor-equipped trap has been triggered. ⦁ Root cause analysis — Site conditions can change before a PMP returns for the regularly scheduled check-up, so having sensor alerts can help capture real-time data and increase the PMP’s investigative abilities with getting to the source of the problem. ⦁ Challenges with access — Difficult-to-access areas are monitored more efficiently and safely because remote monitoring systems reduce the need to get special access with keys or otherwise dismantling building components to set traps. ⦁ Human impact disturbances — Remote monitoring methods can decrease the chance of humans interfering with traps, because PMPs are alerted immediately and can make a decision to adjust or switch a trapping strategy for better rodent control. In its own report titled “Remote Monitoring: Not Your Grandfather’s Rodent Management,” Menomonee Falls, Wis.-based Wil-Kil Pest Control echoes the idea that this new technology is worth investigating. Based on its experience at certain key facility accounts, the Copesan Pest Solutions partner cautions fellow PMPs in three areas. ⦁ Not an “end all-be all” — Remote monitoring alone will not prevent or eliminate rodents from entering a facility. It is one component of a comprehensive approach. ⦁ Not for all facilities — From building design and construction, to what types of products are processed or stored at the facility, to where the building is located (near a body of water, for example), PMPs must consider such factors before making a decision to use remote monitoring. ⦁ Data needs to be used properly — The amount of data generated from remote monitoring can be overwhelming, so have a process in place from the start.